Property managers and owners can use custom hardscaping design in New England to enhance the look, feel, function, and safety of their property. Just by implementing a few simple elements into your existing landscape environment, you can create new focal points, functional spaces, and increase value. 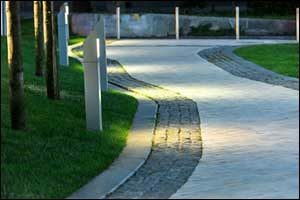 Depending on the hardscaping construction elements that you choose, you can add benefits that will be appreciated by tenants, other businesses, and visitors to your commercial property. Office complexes, shopping malls, multi-family residential properties, and many different types of commercial businesses can all benefit from Rhode Island hardscaping. Custom designs can be even more beneficial, providing a unique aesthetic appeal and enhancement to your property. Low maintenance solutions can be used to reduce overhead costs for cleanup, landscaping, and yearly gardening requirements while creating functional areas that add to the style and detail of the area. Working with a licensed and experienced hardscaping design and installation company is a must. It is essential to choose a service provider who can offer you all of the services required to see the job through from start to finish. Eastern Landscaping, Inc. has a solid reputation for delivering top quality hardscaping construction and design services in Northern Rhode Island and Southeastern Massachusetts. A beautiful sprawling landscape with healthy, green grass makes a definite statement to all who visit your property. However, all of that open space can be wasteful when outdoor living spaces and community areas might be more beneficial. Low maintenance solutions that include patios, built-in benches and planters, fountains and statues, barbecue areas, amphitheaters, walkways, picnic areas, retaining walls and other paved spaces add instant value to your property, especially if they are well-planned and professionally built. Hardscaping construction can use a variety of materials, including stone, concrete, pavers or wood, depending on your needs and the design of your project. Consider the way that the new space will be used. Will it be open to residents at your multi-family rental property? Will it be a place for employees to meet for lunch or relax on their break? Will the new space provide a welcoming and friendly area to attract visitors to your commercial shopping mall or business complex? Make sure that you know how you want the space to be used, who you want to invite to use it and consider including elements that will help you create a memorable experience for those who take advantage of the new space. Working with an experienced Rhode Island hardscaping design and construction team can help you discover new options for your project that you might not have thought of on your own. Many of the projects that can be designed with Rhode Island hardscaping can be used to create advantages for your business. First, by decreasing the amount of landscaping and cleanup work that needs to be on-site by reducing the amount of lawn and garden areas. This can also help to cut down on costly water bills for keeping the plants and grasses properly watered throughout the season. Low maintenance solutions, such as walkways, patio areas, and other common use spaces for employees, customers, visitors, and tenants, help to maximize the options for your property in many ways. Sustainability is a hot topic these days, and everyone wants to do their part. Instead of choosing concrete for your outdoor functional space, consider rock slabs made from flagstone and other permeable paver materials to allow water to run-off into the ground. This can help to provide moisture to trees, shrubs, and other low maintenance plantings that are strategically placed in the hardscaping construction area. Seating areas that include built-in benches, tables, picnic tables, and other functional items, are also appealing to just about anyone. Increasing the value of your property with regard to real estate estimates is one thing, but boosting the value to those who frequent your property by creating useful space is another. The best thing you can do to ensure that you make smart decisions about hardscaping design in New England is to work with a professional team that has the knowledge, training, experience, and equipment to install hardscaping construction on your property. This is a significant part of the process, and it should not be taken lightly. There are many different types of contractors and handymen who will take on this type of project for Rhode Island hardscaping, but you need to understand that it is much more complicated than it seems. Eastern Landscaping, Inc. has served the Northern Rhode Island and Southeastern Massachusetts region for many years, and we have a portfolio full of happy commercial clients and residential customers who can attest to our success. Give us a call at 401-766-9035 to schedule a NO COST estimate for our services and view our gallery online to see examples of our work.